One of the spots I go for a walk. The sign indicates the road ends ... but only if you're in a car, lol. The pathway leads to a lovely walk along Lake Ontario. That's it for this week folks :) Thanks for playing along. See you next week ... until then click on all the delicious mellow yellow links below. 26. The Laughing Idiot @ Picture This . . .
Care for a game of drafts? Never saw that type of sign before. It certainly does grab your attention! It does look like a lovely area for a walk. Looks like a chessboard, have a great week Anna. I like that sign and I've never seen one like it!! I'm surprised by the number of people who've never seen this kind of sign before...hmmm. Wonder if it's just a Canadian thing .. or North American thing. Very interesting! For sure I've seen that sign everywhere since I live in Canada. Love your neat yellow sign - it's kind of a weird sign though - puzzling. lol ... the sign means 'road ends' or 'dead end'. I'm loving that it appears to be a Canadian thing - I always learn something new with Mellow Yellow! I love the checkered sign. Happy MYM! My first Mellow Yellow Monday post is up and ready for your comments, critiques & suggestions. Looks like a checker board game. Cute sign. Oh what a lovely place. I would love to park my car and go for a walk there. Like the sign and would love to walk along the path!! I live in BC - we have signs like that, too. Sometimes, there are directional arrows in the middle. it's the first time that i've seen such a sign. quite unusual. i am sure the walk will be worth it! 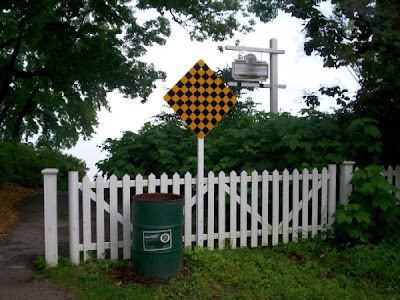 You definitely can spot that bright sign next to the pretty white fence. whoaa! i'd never seen sign like that before coz maybe i dont drive?! I like this one very much. The emphatic sign, meaning . . . what? You said Cars Must Stop, but I wouldn't have known. Excellent composition. i'm joining for the first time..great meme! It's sort of like a secret garden for mellow yellow people only. Suddenly realised that I did not leave a comment! Bad girl! Love this sign! It looks inviting though wordless. Suggests a game! Whoever designed this was very clever! I love yellow too and your site just made my day. Usually, on Monday, I post monochrome, so it would be hard to double dip and fit in a yellow meme. I am writing to let you know that our 7/28 and 7/30 posts are odes to yellow, specially July 28th. It is a shot of a yellow chair in a local museum. So, if you want a burst of yellow from Greensboro NC USA, click on over!!! sorry I linked from my poetry blog (if) my nick in my photo blog is "lluvia"...this is my last week´s photo...I also love yellow!